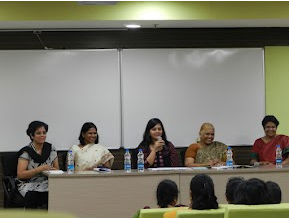 The above panel of accomplished experts in their respective fields came forward to share their experiences and real time cases that they have personally dealt with to equip women in various industries especially in the ITES space on how to deal with these situations. Dr. Geeta Madhavan is an Attorney with specialization in International Law. She is a consultant on International Law offering her expertise to academic departments that feature International Relations programs. 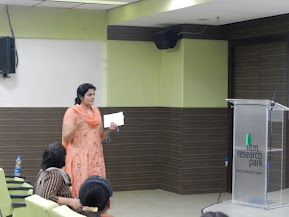 Dr. Sangeetha Madhu is an MPhil from the National Institute of Mental Health and Neurosciences, Bangalore (NIMHANS). 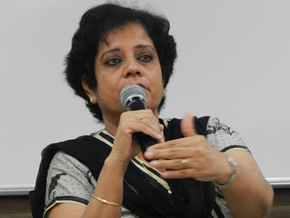 She is a practicing clinical psychologist and Director of Chennai Institute of learning Development (CHILD) & The National Sports Medicine Centre. Her areas of expertise are in Child and Adolescent Mental health, Psychometric Services and Corporate Counseling. Ms. Sumithra Mathew has been associated with the IT Industry for over 20 years and has held key roles within the scope of a Global HR team. With a Masters in Economics and a PG Diploma in IR&PM, she is currently Vice President – HR with Polaris Software Labs managing Strategic HR Partnerships within the Corporate Functions & IMEA region. 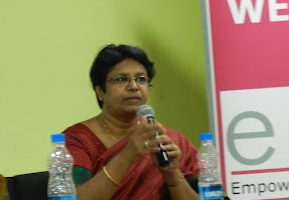 Ms. Vasunthara is the Assistant Commissioner of Police for Cyber Crime Branch. After networking over tea and snacks, the session was opened by Ms. Sarada, General Secretary, eWIT on the topic for the day and an introduction to the panel followed by a brief on eWit and its initiatives by Ms. Kalyani, President of eWIT. The session went into full swing moderated by Smita Venkataraman, a seasoned HR leader who has held various leadership roles at leading MNCs. She is currently the Associate Director at AGS Health and specializes in the area of Talent Management and Leadership Development. Dr. Geeta Madhavan gave an insight into the current situation of crimes against women and mentioned that the statistics are astonishing. The root cause is that women sit back and don’t take any action. She gave a brief on the different types of harassments that come under the purview of the law and even a simple word that can disrespect a woman is liable to come under the law. This piece of information was key that so many in the audience did not know. As a lawyer, she stressed that there is great faith in the law but all must be encouraged to use it. Women should not be afraid to use the law even if they are abused by their own family members. 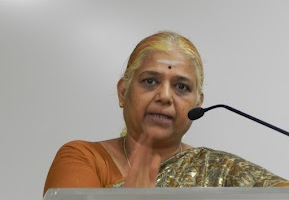 Dr. Geetha Madhavan reiterated the importance of self respect that women need to have for themselves as individuals. 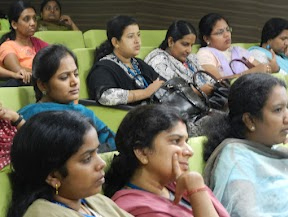 The next talk was by Sumithra Mathew who touched upon gender issues in the IT industry. For the most part, the IT industry is mature in its initiatives involving women but yet there are some sections of women who do not speak up or do not know where to go or how to act when in a situation. Dr. Sumithra very practically explained 3 critical points to be aware of that can make your situation so much better: A – Act – don’t be afraid to speak up and take action for any harm done against you, B - Be aware – how to dress, how to talk, be aware of your body language and you as a person, C – Communicate – voice your opinions, share your experiences with people, reach out, create forums to address issues, create an environment to communicate. Ms. Vasunthara, Asst Commissioner of Police – Cyber Crime Branch evoked a sense of awe when she took the podium. This was due to the fact of having a police officer in the room. Ms. Vasunthara highlighted cases of cyber crimes, blackmailing using photographs on the internet, usage of MMS etc., Sadly she has received a large number of cases wherein the girls are at fault. She stressed that sharing of personal information such as email IDs, passwords must be restricted as these can be misused. A lot of light was shed on the differences between domestic violence and sexual harassment laws – where to go file a case, which police stations to approach, and the history behind the Visaka Judgement. As a police officer and a parent, she reiterated the importance of speaking up, taking action and most of all keeping your parents informed as ultimately they are the sufferers. 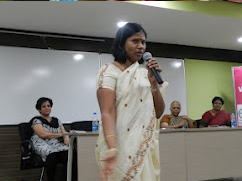 The last session added a punch when Dr. Sangeetha Madhu took to the floor and brought out issues on the children of today, mental state of parents and single mothers. She gave her own experiences of gender discrimination and how the suicide rate in women is at an alarming high. Dr. Sangeetha mentioned that the state of a woman’s mind is crucial to her well being and that we as women should understand our strengths and vulnerabilities. Women should support and nurture one another in whichever type of place they are in and must have faith in one another. The floor was opened for Q&A and very relevant questions came up pertaining to dress code in the office, problems faced when sent for an onsite deputation, young women who are recently married and cannot handle their marital problems, empowering of women vs freedom, when and how to control teenagers and the things that they are exposed to in society, handling peer pressure, what to do when your organization does not support you etc., The questions brought out various discussions and responses on how to handle such situations. The bottom line that came out clearly from every point of the session was that women must speak up and act. The vote of thanks was given by Ms. Namagiri, Jt. Secretary, eWIT to all panelists, moderator and participants.